The impact of 3D printing has been felt by thousands of companies. 3D printing is a business enabler. It empowers businesses to create new opportunities. The large-scale adoption of the technology also does impact 3D printing, in turn. The words “3D printing” may sound uncommon and esoteric. But it is an evolutionary technology that has the ability to be disruptive. The technology has been around for more than 2 decades. Rapid prototyping has been the most popular application so far. Several new use cases are opening up every day. We would like to look at how 3D printing could benefit you, the customer. 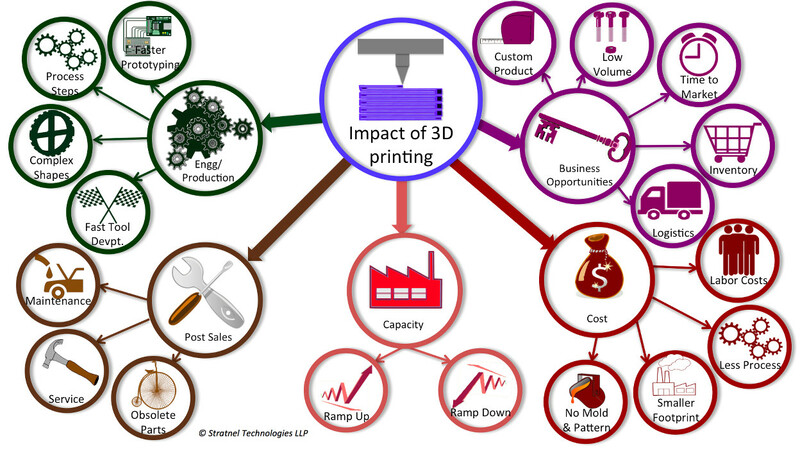 We outline below how 3d printing affects different areas of the business.While creating new business opportunities, it does affect the traditional way of manufacturing goods. Every factor of production including engineering, sales, supply chain and maintenance will reap benefits. There are also cross-benefits between these factors that help to multiply the overall benefits. For a detailed briefing on the impact of 3D printing and how it can help your business, get in touch with us. 3D printing helps to open up several business opportunities. 3D printing helps Engineering and Production to improve their methodologies by shifting their paradigms. This helps the business to gain significant competitive advantages. The cost advantages that arise out of implementing 3D printing come from several factors.